Using garage floor mats allows you to easily protect your flooring from heavy impacts and automotive fluid spills. Using mats is the cheaper alternative to using garage floor tiles and are far easier to install as they simply unroll out onto the floor. The best garage floor mats are the Armor All AAGFMC22, which are available in 5 different sizes and are great job at absorbing rain, melted snow and other fluids. For those that park inside the garage on a daily basis, the mats will absorb the liquids from the snow. This will allow you to stand onto an anti-slip surface when you get in and out of the car and avoid road salt or deicing fluids on your floor. For those that live in a climate where snow and ice is a regular occurrence, you will want to choose a garage floor containment mat. The main purpose of these types of garage floor mats is to hold the gallons of water, which are a result of snow, ice and water collected by your car. Installing garage floor mats is fairly straight forward and you can opt for a simple roll out mat or one that is tailored towards your garage. You can also use a utility knife and cut the mat to suit your garage floor and features. Some people may only want to hide a defective floor and choosing a mat is a highly effective method of doing exactly that. Below is a list of the best garage floor mats that will protect your flooring from high impact, fluids and also provide better traction. The most popular garage floor mats are these Armor All AAGFMC22 mats, which are available in 5 different sizes. 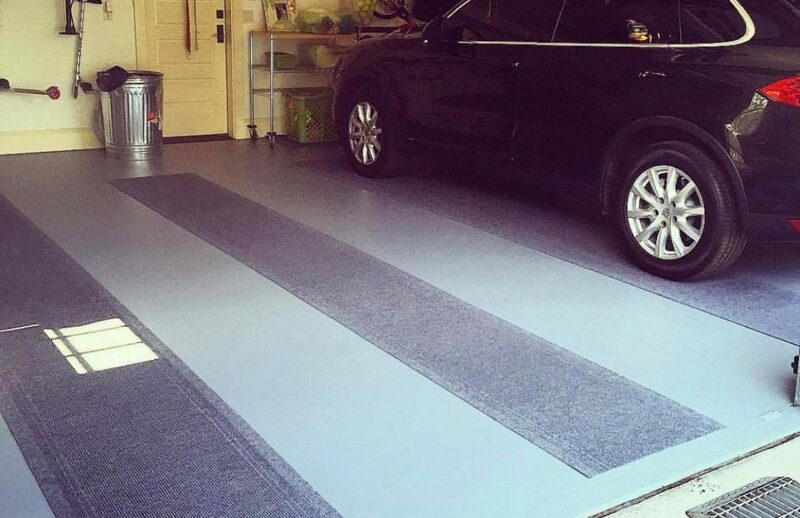 They are easy to install and an affordable option when it comes to covering your garage floor. Although the Armor All AAGFMC22 are not a containment type of mat, it does a great job at absorbing rain, melted snow and other automotive fluids. Unlike many of the alternatives, you can even use a pressure washer to remove tough debris or stains. Overall, they are the best garage floor mats for cars that provide great protection, dry quickly and are non-slip. They are also a universal fit for most garages as they can be easily cut to fit around edges and corners. For those that require a garage containment mat, the AutoFloorGuard is by far the most popular. The popularity is due to the fact that it is a heavy duty commercial grade fabric that is both mildew and rot resistant. Overall, the AutoFloorGuard AFGS-7916 is the best containment mat for your garage floor and does a great job of keeping water and dirt off your floor. The raised edges are a great feature and not something you will find on cheaper alternatives. 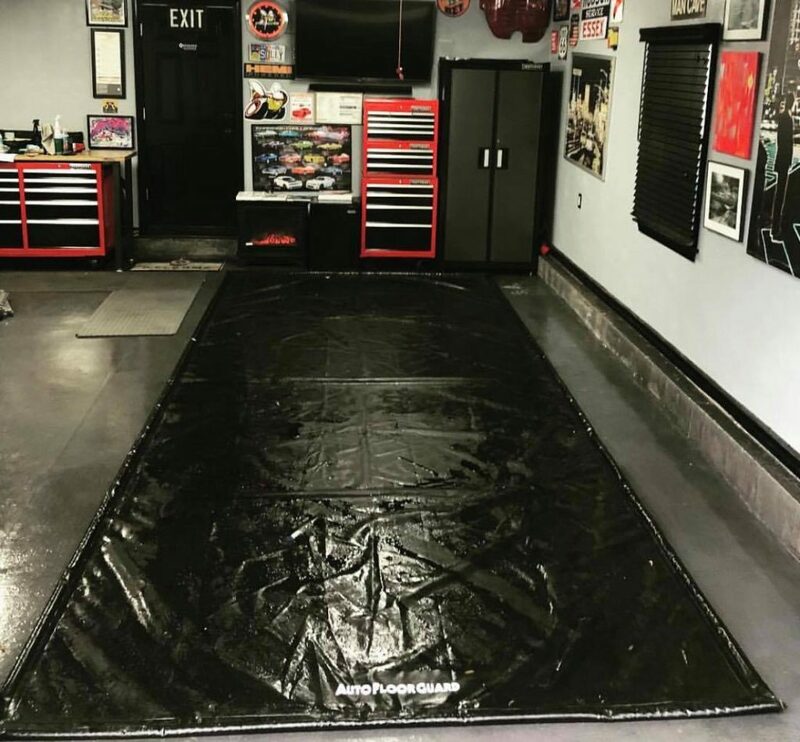 Another containment mat for garage floors is the TruContain, which is available in 4 different sizes and features a much thicker fabric than the AutoFloorGuard above. However, this does come at a premium price that makes it not as popular. Overall, the TruContain Containment garage floor mats are an excellent choice for those regularly travelling in snow, ice and mud. However, they are on the more expensive side but you do get slightly better quality when compared with the AutoFloorGuard. For those looking for a tougher alternative, the HDX garage floor mats are constructed of 100% polyvinyl and zero “filler materials” often used by cheaper alternatives. This material is durable and resistant to most automotive fluids found within a garage environment and is relatively affordable too. Overall, if you are looking for heavy duty garage floor mats that will not crack, split, peel or deteriorate, the HDX flooring a great option. One drawback that you may suffer from is the fact you may require adhesive to ensure all edges are flat on the ground. This is primarily due to the polyvinyl being more rugged compared to the lightweight fabric alternatives. The Casa Pura are cheap garage floor mats that are made from a dual PVC layer with micro air cells. It has a range of 7 different sizes to choose from as well as the option to choose a 1/4 or 1/8 inch thickness. We recommend the thicker mat as the ribbed design will capture more snow, ice, mud and other debris more easily. If you are looking for a cheap solution for covering your garage flooring, these garage floor mats are ideal. The huge range of sizes available are ideal for covering even the most awkward of garage floor space. On top of this, as they are so cheap, trimming them with a utility knife is not as risky when compared with the more expensive alternatives shown above. The garage floor goes through a lot of heavy usage from the constant strain of a vehicles weight to heavy impact of tools falling and then fluid spills such as oil or melted snow. Investing into quality garage floor mats is a way of combatting the problem and protecting your garage floor. If you have recently painted your garage floor, you will want to keep it in pristine condition. Therefore, placing a mat in areas that could potentially become damaged is highly recommended. If you live in a state where you are regularly driving on snow or ice, the containment style of mat is highly advised. To help you make a more informed buying decision, we have produce a detailed buying guide below. For those that frequently drive on snow and ice, your best option is to choose a garage floor containment mat. They are designed to hold gallons of water and other fluids that drip from the car once its parked up. This will avoid the buildup of snow, ice and water on your garage floor, which can be a slip hazard and cause damage too. Most people forget that along with the snow or ice are other harmful fluids such as deicer or road salt, which you will want to avoid bring into the garage space. The design of garage floor containment mats include a raised edge that is between 1 to 1.5 inches in height. This keeps the water inside the mat and prevent it spilling out onto the garage floor. Of course, to prevent the edges from becoming damaged, most are made of a high density foam that are heat sealed into the mat. The purpose of this is to prevent any damage as you drive over the edges. Garage floor mats are usually constructed of vinyl or polyester depending on the type of mat you choose. Vinyl are usually found on the cheaper mats and has great waterproofing qualities and resistance to chemicals. However, unless you purchase a thick piece of vinyl, it is not actually that strong but this does means it is easier to cut it with a utility knife. Polyester floor mats are far more durable and are often coated with PVC to provide a good all-round mats. Most brand will use a non-woven polyester, which although is not as strong but it does have the added benefit of a better seal. One of the most important parts of the construction of the mat are the seams. The quality of most garage floor mats can be seen by the seams and if they have been designed correctly, they will be able to withstand any tears. Most of the brands these days will use heat-welded seams, which will prevent any tears. However, the quality of the seam can also be an issue as if there are any gaps, it will allow water to escape. Some mats such as the AutoFloorGuard locate the seams underneath the mat to prevent them tearing and increase its lifespan. The issue with containment mats is that they do not look aesthetically pleasing. However, for those that do not actually require this type of mat, there are plenty of alternatives. For example, the best garage floor mats within this article are by Armor All. They not only looked great when rolled out on the floor but they also absorb the water from snow or ice. Other designs include a ribbed layout that trap any water and many others. With most garage floor mats, you are able to cut them to any shape you wish too. Not everyone will have a perfectly square garage, which means you may be required to become creative when installing them. You may only want them to be the width of your tires and not covering the whole floor as shown below. Compared with tiles, using garage floor mats is far easier to install and a fair amount cheaper too. There are a variety of different styles available and ones thats primarily purpose to contain the melted snow and ice. All of our recommendations within this article cover a range of suitable mats with various budget in mind. Before purchasing any mat, ensure that you take proper measurements of your vehicle. Once you have these measurements, you will want to ensure that there is a suitable gap at the front and rear of the vehicle. This mean you will not have to perfect your parking each time.